It’s happened to all of us. We come home and find the door locked and no key in our pocket, or we lock ourselves out in our underwear while running out to grab the paper. The other day my wife stepped outside in her pajamas to water the flowers and our two year old shut the door and locked the deadbolt, just to tease her. He just looked through the window and laughed while she begged him to open the door. Well, there is a new solution to this problem. Check out the Lockey Key Safe Box. Install this box on the exterior of your home, or whereever you want to store a key with limited access. If you forget your keys or lock yourself out, just punch in your code and retreive your spare set. Just don’t forget to put them back. These key safe boxes are great for other uses too. 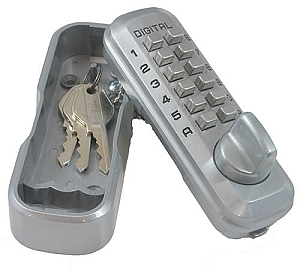 It’s perfect for isolated locations where it’s not always possible to physically hand over a key to someone. Store keys to your equipment or vehicles in the keysafe box so that they are there when you or a friend or employee needs to use them. The mechanical lock design means you don’t have to worry about dead batteries, and the simple design provides reliability. See also, other mechanical locks from Lockey.